The "Take It!" came from looking at this tree along with many others that had been "power cut" to accommodate either phone lines or power lines or in some cases both. 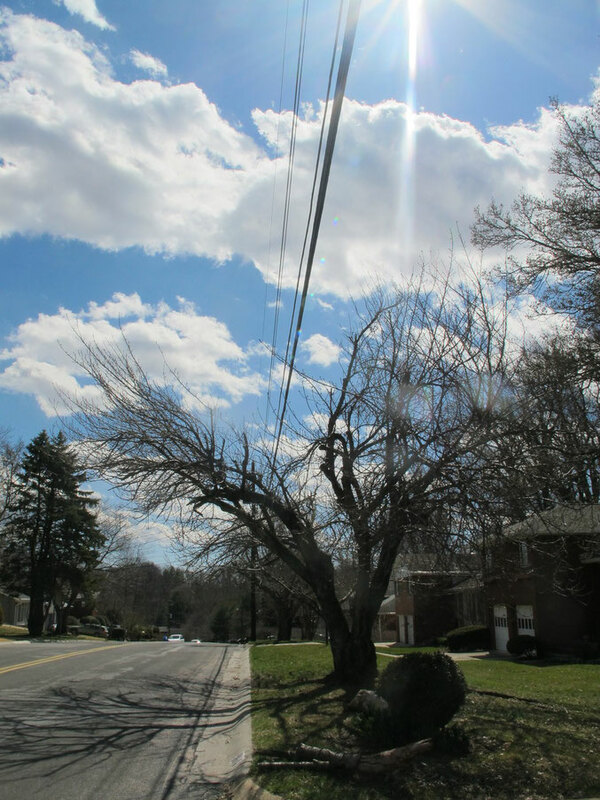 These trees are usually situated next to the curb and share some of the same real estate as the power poles. The v shaped cut is entirely understandable in one sense from the accessability prospective - but in another way - renders the tree looking a bit odd to say the least. On one morning shortly before taking this photo I occasioned on a very mature tree that had obviously been subjected to this type of trimming for many years. It almost looked like two trees joined by a mutual trunk situated below the v cut. Somewhere in the recesses of my mind - that wonderful dance song that is usually played at weddings where there are children in attendance. This song and dance are delightfully simple, so that even very young children are invited to dance ( usually by a grand adult ). The words to the song resonate with everyone who has ever heard it - and even more so with those who have danced and sung it. Parts of it include: " Do the Hokey Pokey " You lean to the left and you lean to the right " " And that is what it is all about ". At the end of dancing to this song - everyone returns to their seat with a huge smile on their face and somewhere in there a bond of sorts has been formed with the partner with whom the dance was shared. Many times the dancers will sing along while making all the moves. Even those who are not on the dance floor have been known to stand and make the moves while singing the words to the song. The After Take: Once more - the smiles on the faces to whom I showed this picture spoke of joyful memories. Many were quite tickled that I had chosen such a title to associate with the photo. There are some that I shared the photo with that were fro other countries and had not yet heard of nor seen this wonderfully ritualistic dance. I enjoyed telling them about it which of course involved my singing parts of it as well as performing a few of the important and in this case relevant moves. These exchanges were concluded with laughter and them looking forward to that possibility of being invited to a wedding where this dance would be played. It is my hope that this picture with its fun title will bring back a memory or two for each of you. PS: This photo was taken on the same day the Spring Banner was taken. Knowing I was going to take, it found me searching for a great example of the leanings. Good grief - there were some blocks that it almost looked like there was a line dance of the Hokey Pokey that was going on. Many trees in a row had this same treatment. I am fond of this enjoyable take away - but must say it does make a statement in favor of underground utilities. That tree should be in a haunted forest somewhere. Thats cool how the power lines go right through the opening in the middle. I have always found it very interesting that we can actually train these trees on where to grow and where not too. There is one by my house like this that the city no longer trims because the tree no longer grows in that middle gap.